The idea for this recording formed, as many good ideas do, during one rehearsal. As it was the case, the rehearsal hadn't anything to do at all with this recording: it was one of the rehearsals for Wolfi Schlickhorn's Wonderbrass, where suddenly drummer Groxi (a.k.a Der Künstler Groxi) asked whether the group would like to perform at his art exhibition's opening at Café Vor Ort, Neuried bei Gauting, on 1st of July 2000. "But then", he added after a short pause, "this wouldn't be so cool anyway, as I don't want to perform at my own vernissage". "Well, but if you're looking for some weird musical concepts to accompany this event, I might just drop in and carry some of my gear along", said the group's lead trombone player, one Rainer Straschill. "Cool thing. 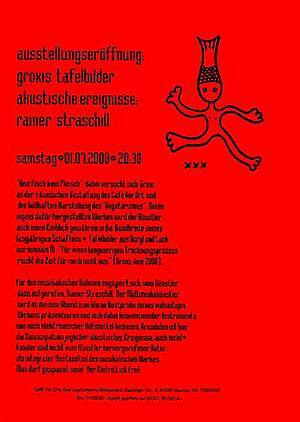 It starts at 'round 19:30 at Café Vor Ort, Gautinger Straße 3". A Moinsound Weirdstuff Productions concert had been organized! The evening began when after taking a wrong turn enroute to Neuried bei Gauting (a former teacher at our school used to tell jokes about this place in the suburbs of Munich, which was an oldschool farming place not long ago, but has become a quite chic neighboorhod in recent years and also seems to form the center of the Würmtal art scene). I arrived at the place already sporting chalkboards with large "Rainer Straschill tonight" inscriptions and was greeted at the door by Groxi and Sylvia, the latter one's first question being if I'd like a drink. A warm welcome indeed! I'd planned to be ready for performance about 1900, then have a quick dinner and start performing afterwards. After all of my gear was set up and two short loops came to reside in the boxes, (did I mention that I brought along quite a lot of weird stuff, and that it was the first time that I set up this gear in hostile environment ? ), it was close to 2000, so no more dinner before the show - just off with the stuff. Set two actually starts as set one has ended in Seminar für Statistische Akustik, Teil 1 with samples of the very announcement that ended the first set - followed by yet another weird bass solo, which then segues into the second part of Subwars for a talker guitar solo - all of this accompanied by the soprano sax loop we know from set one's "Edges". The solo ends with a start of the "heavy Subwars groove", forming the basis of an extended organ solo. Yet, the synths kick back for another solo, which ends at 7:30 into some arpeggiator mayhem. The arpeggiator, incorporating analogue filters and all, continues into Seminar für Statistische Akustik, Teil 2, which again clearly shows the basis for its name, with soprano sax, synths, loopers, filters, delays and modulation effects kicking in in any combination imaginable. This sonic madness fades into the last few minutes of the performance, played on the trombone with a Coda: Theme from Hairless Heart.